I know it's been a terribly long time since I posted anything here. 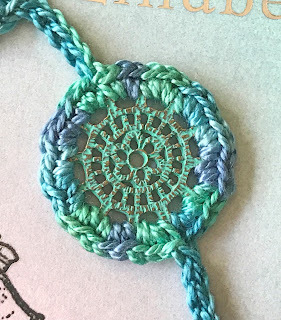 No excuses, but I am sorry. 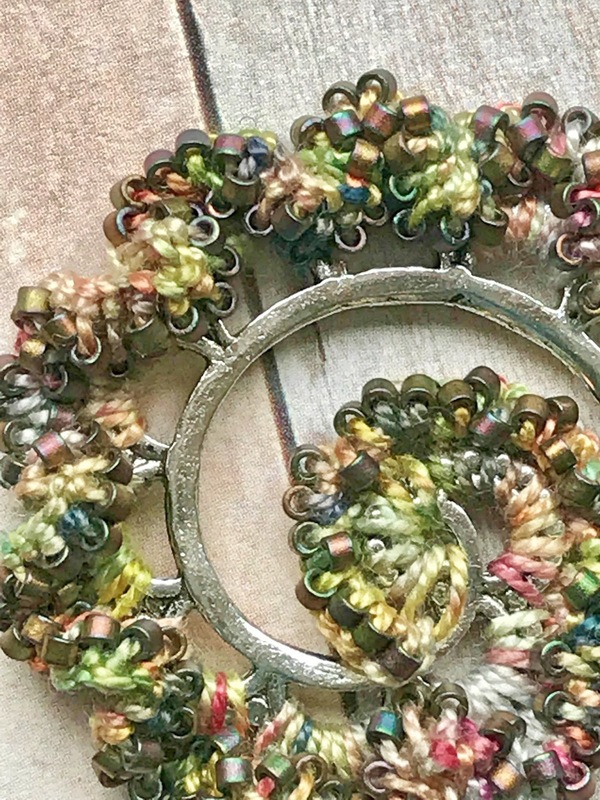 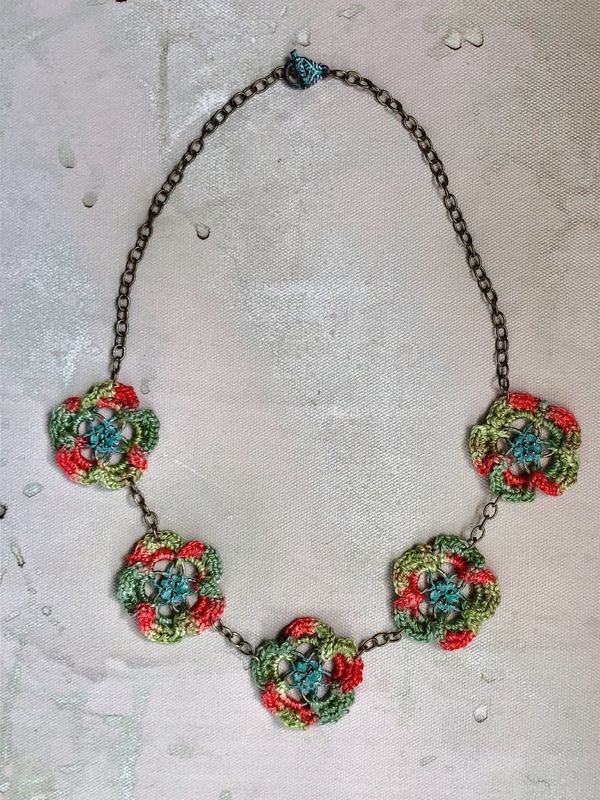 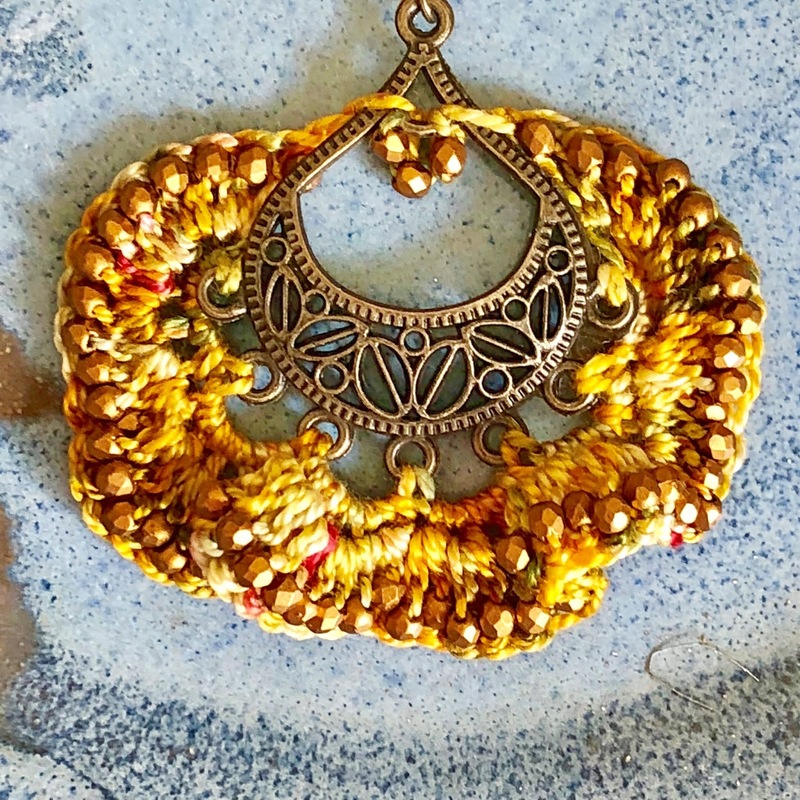 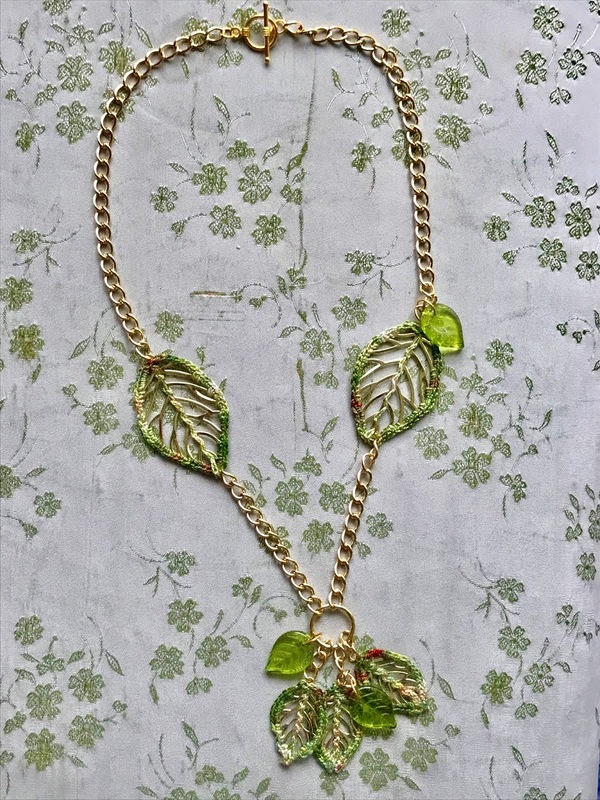 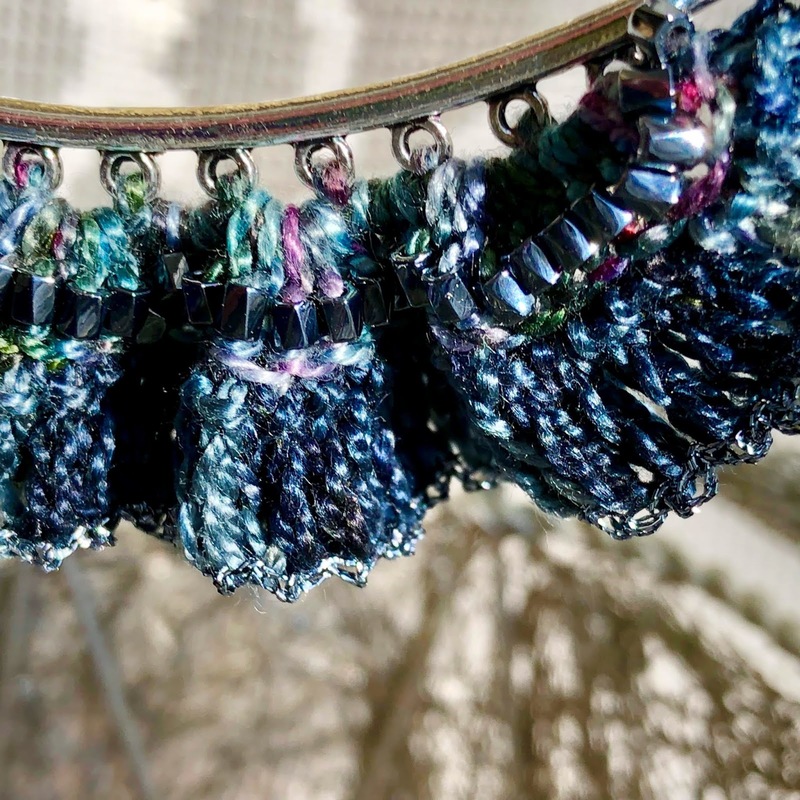 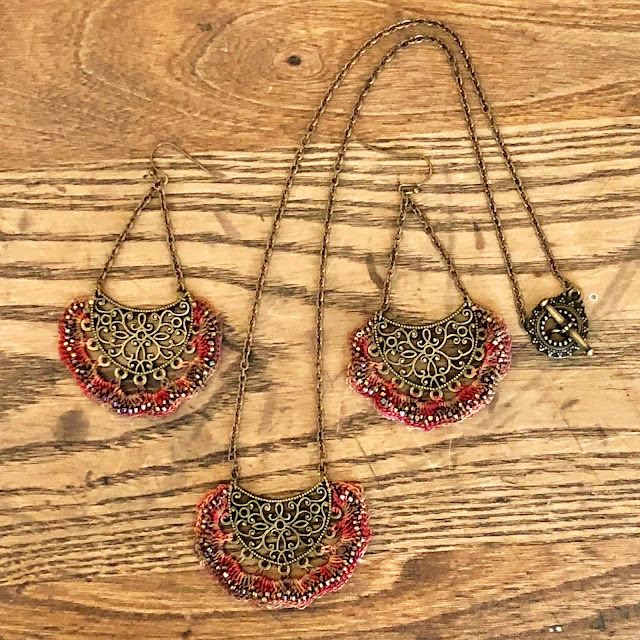 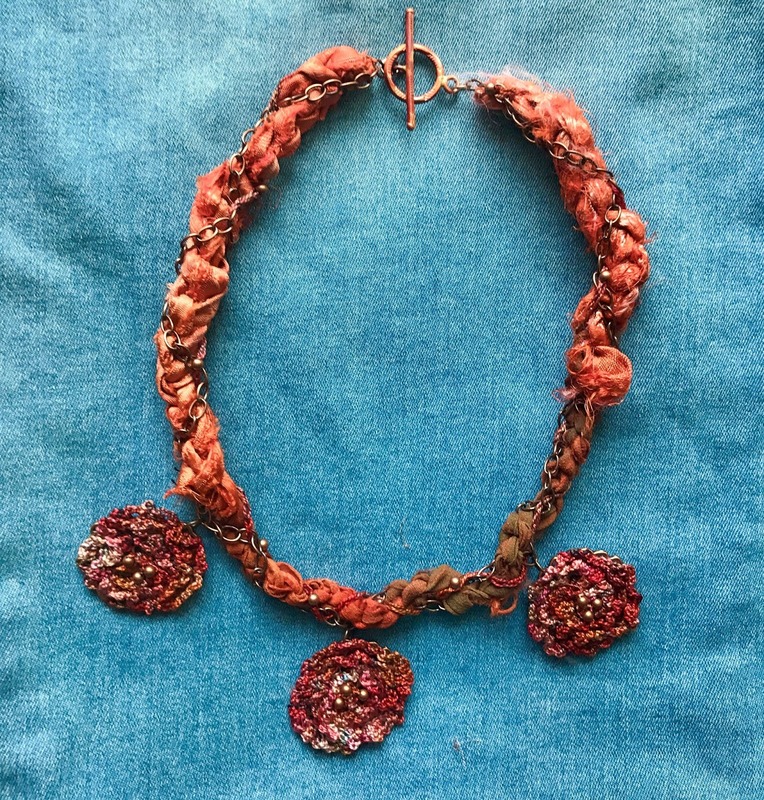 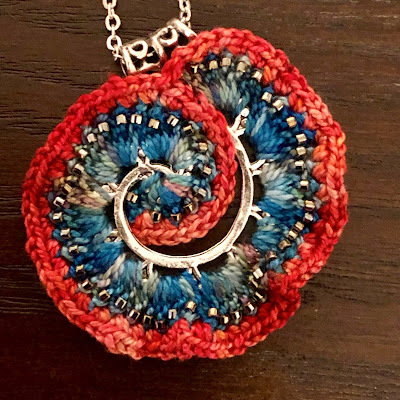 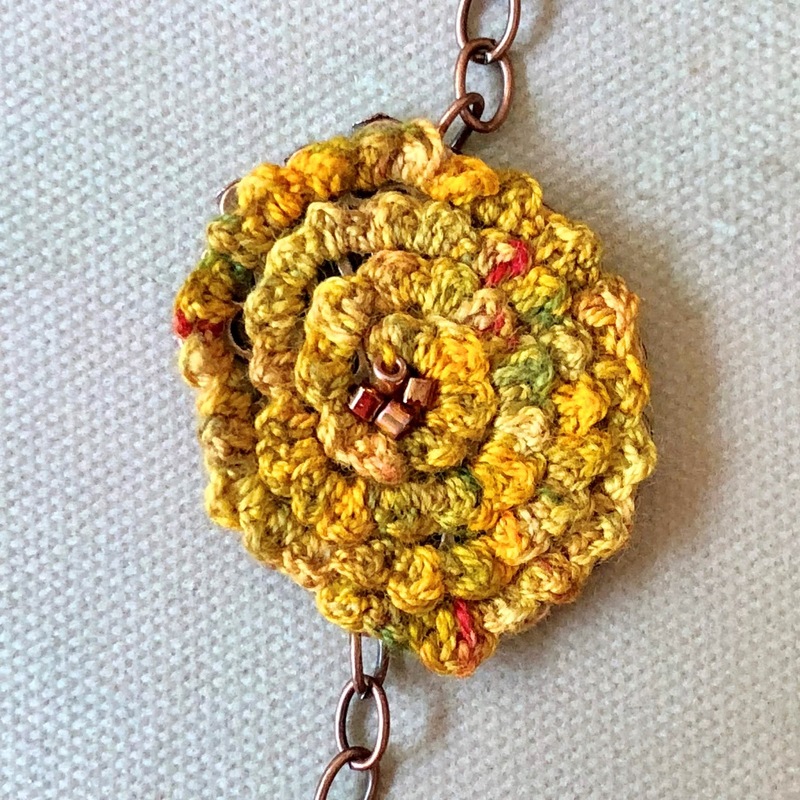 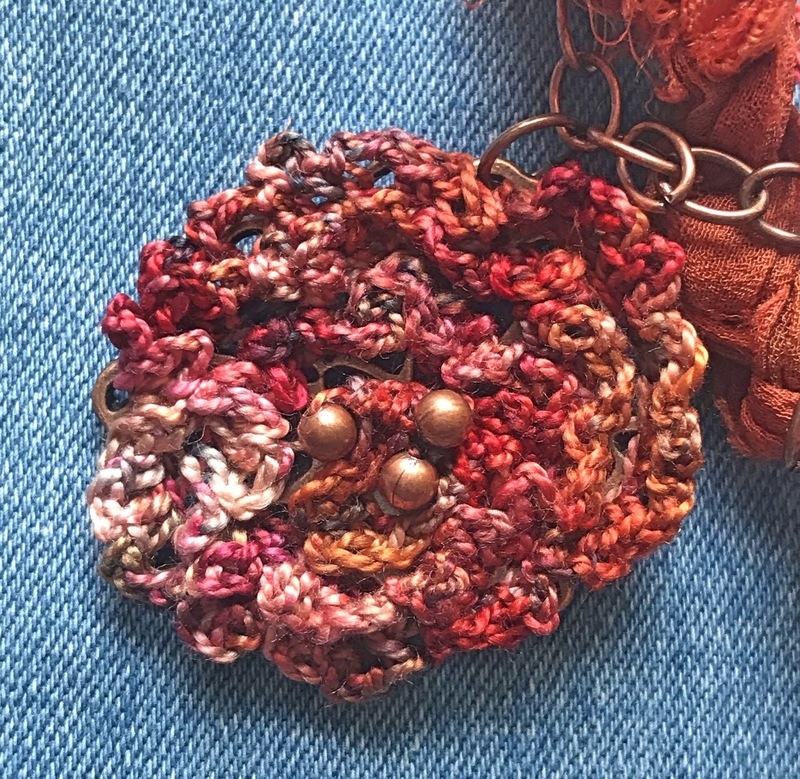 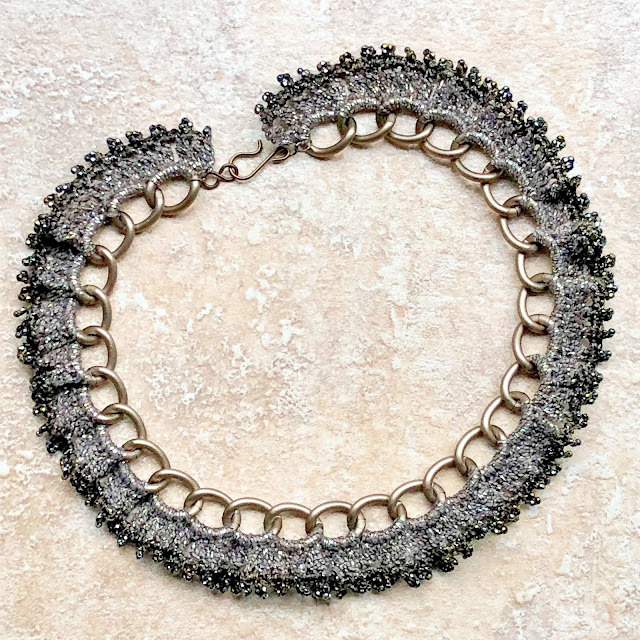 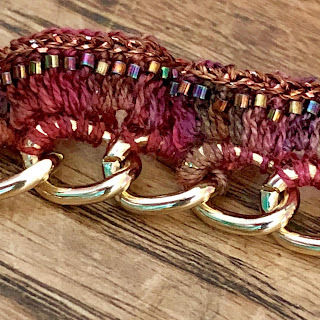 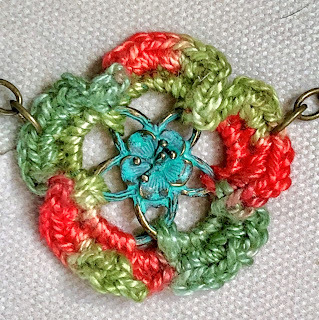 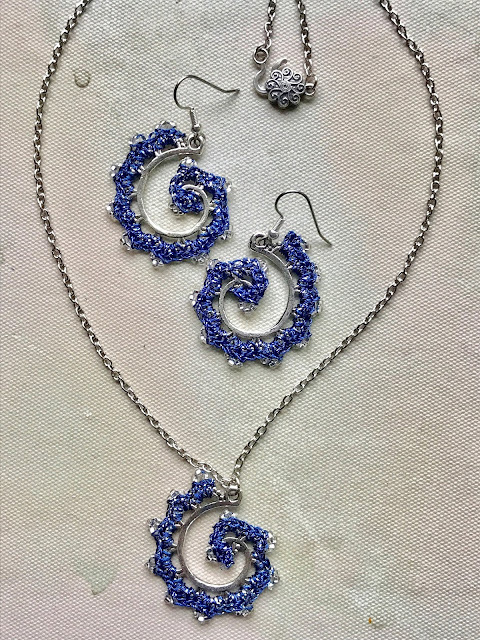 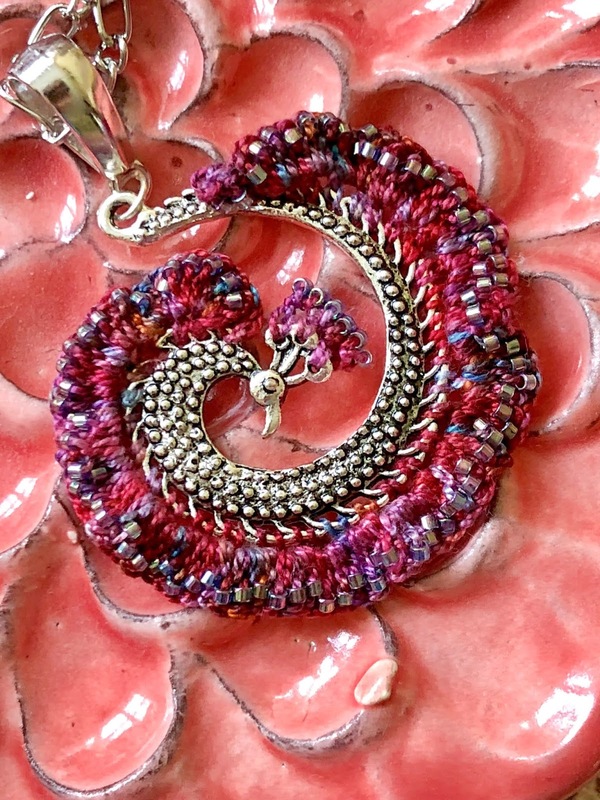 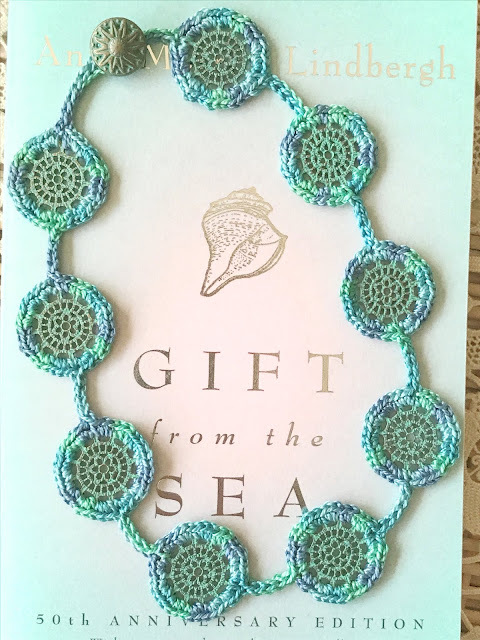 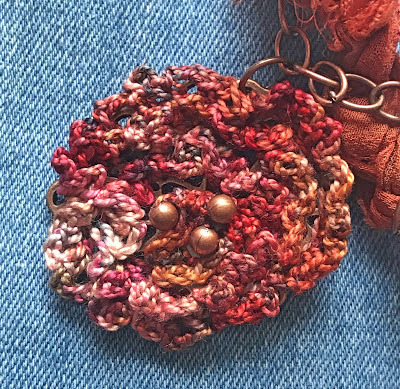 That said, over the course of the last year I have been busy experimenting with the combination of hand-dyed threads and metal components to create crocheted jewelry. I've done this to some extent almost since the inception of Gossamer Tangles, as I've crocheted fiber into metal chains. 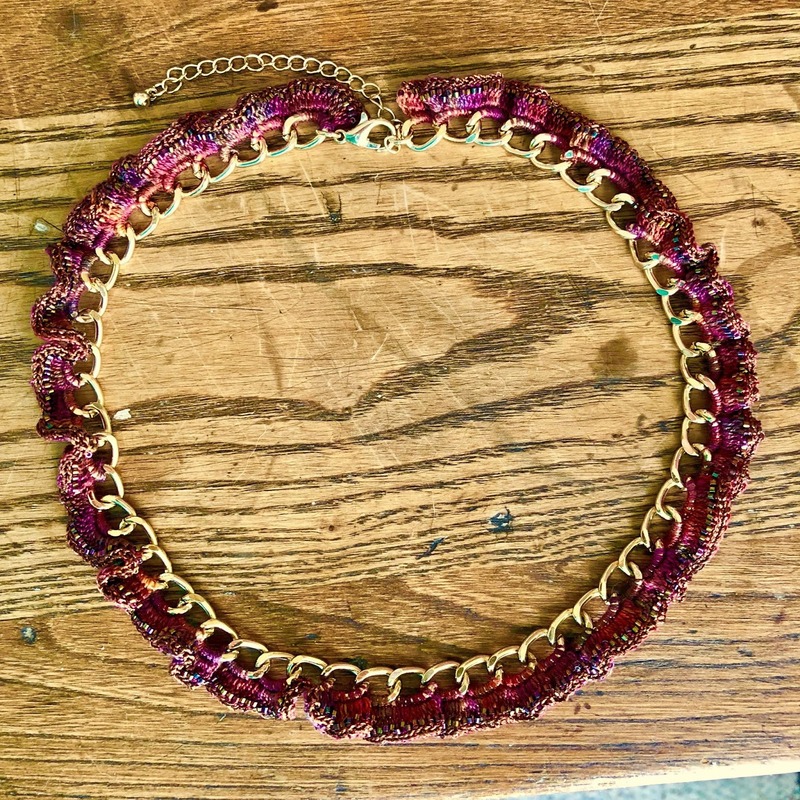 to create necklaces. 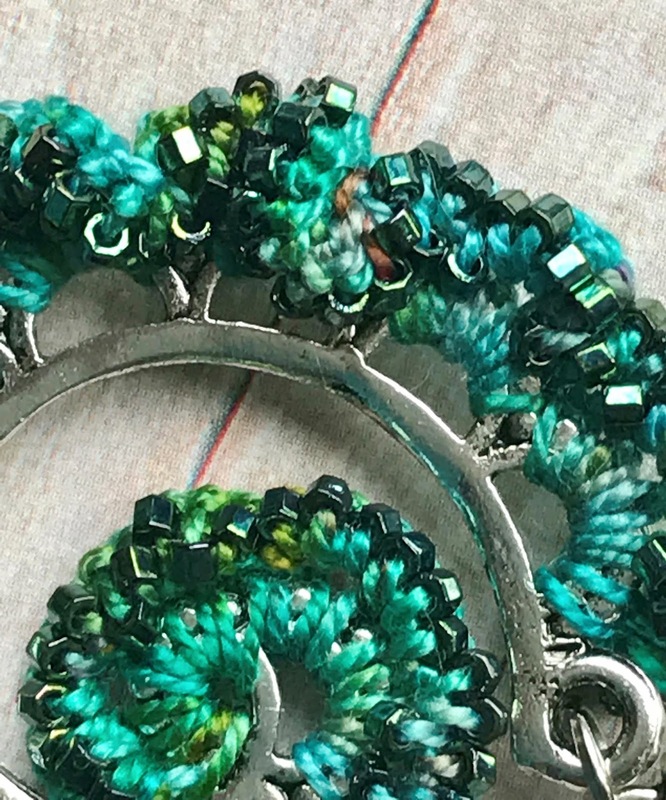 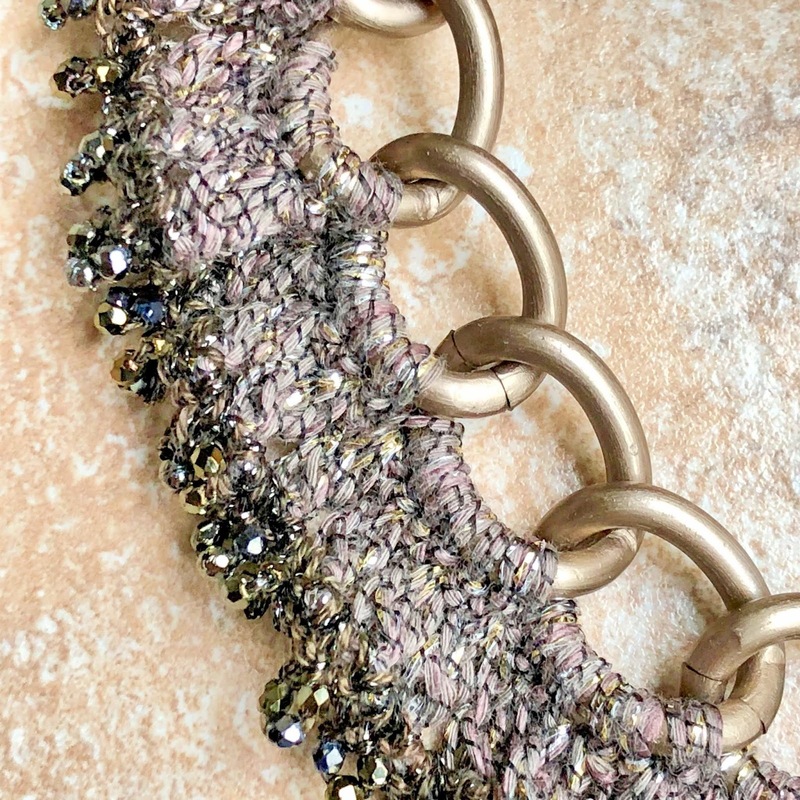 I've continued to work on techniques for crocheting into metal chains. 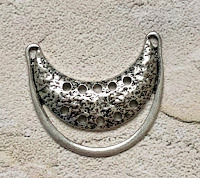 Perhaps one of the most important factors in choosing a metal component is the size of the "holes". They need to be large enough that you can squeeze a crochet hook through; although there are work-arounds, if truly needed. 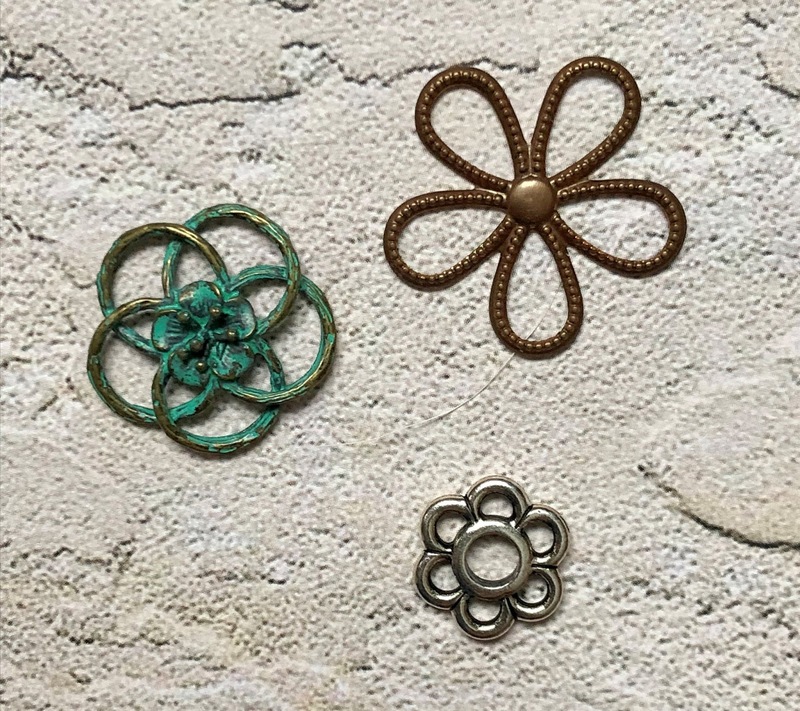 For example, when working with the many-holed floral pieces shown in the just abov, I used my thread to sew straight stitches in a spiral pattern over the metal component by using the openings as though they were holes I was making with my needle through a piece of fabric. I then worked my crochet into those stitches. 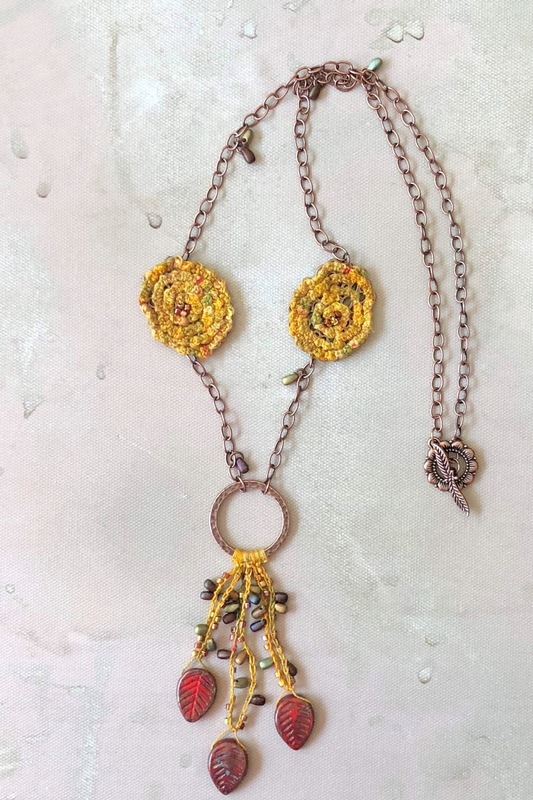 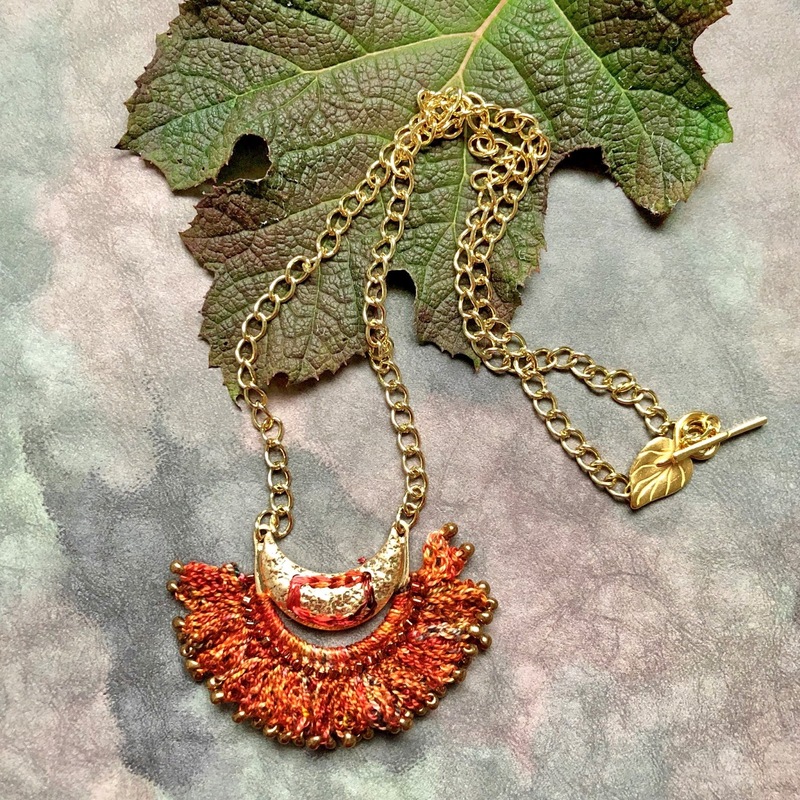 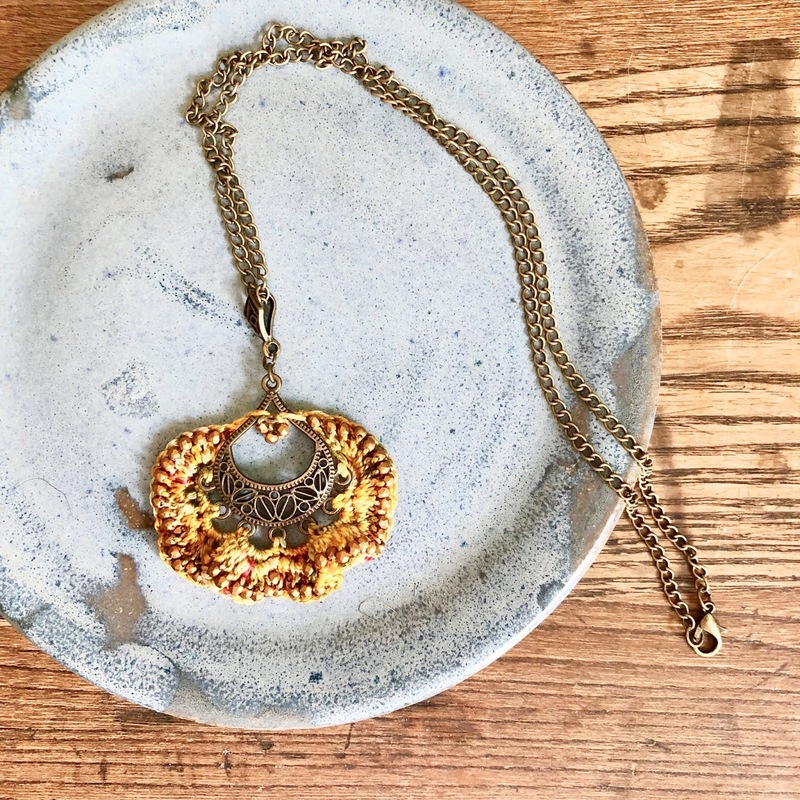 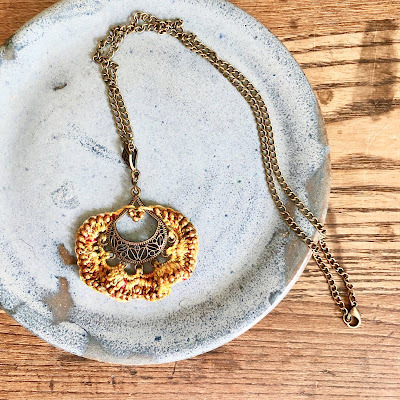 You can see the results in the yellow/gold and rust/copper necklaces below . 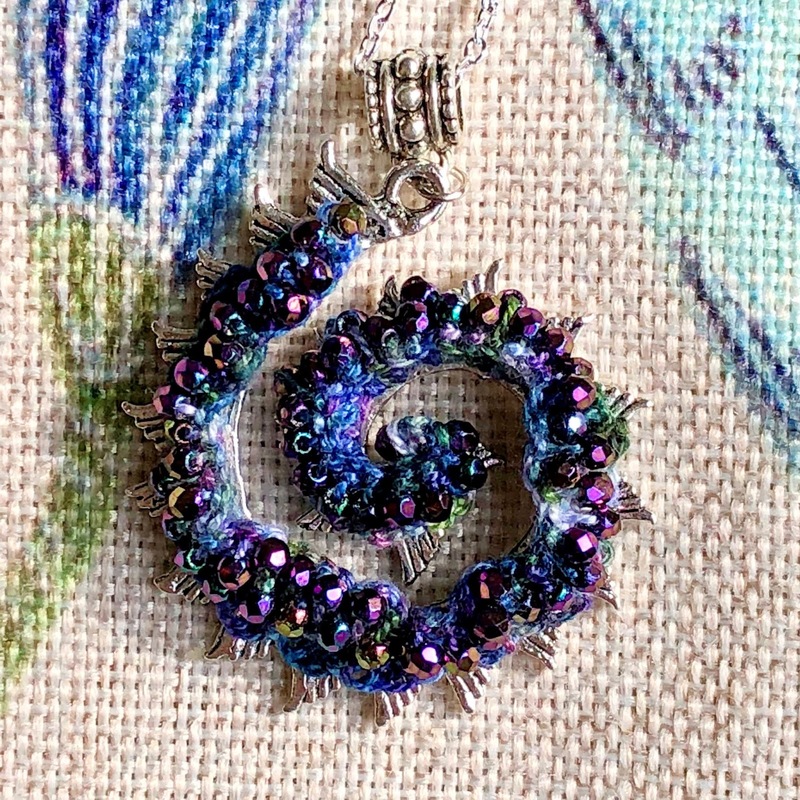 Spiral components have been some of my favorites to work with. 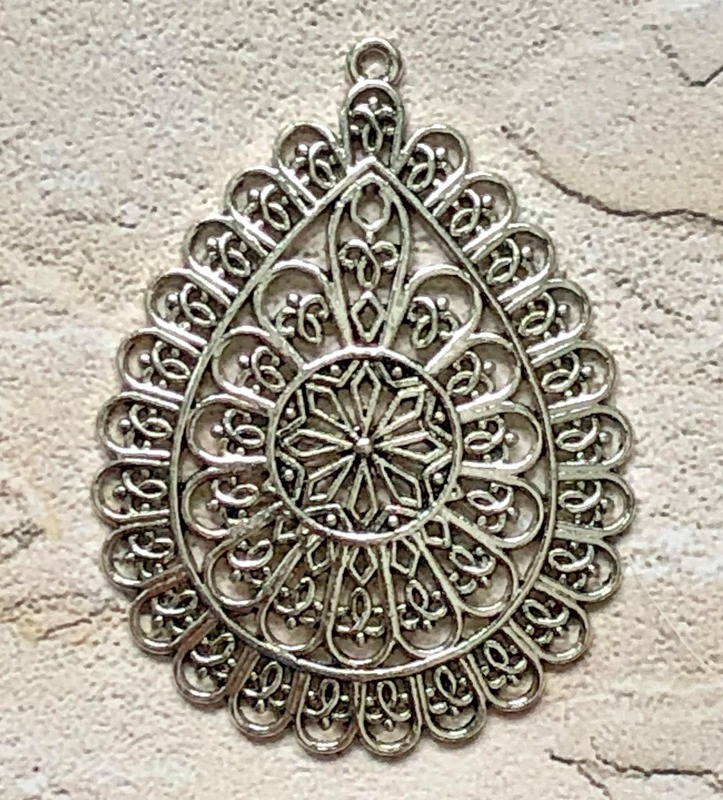 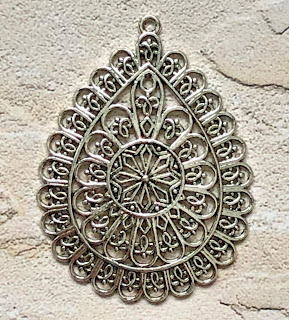 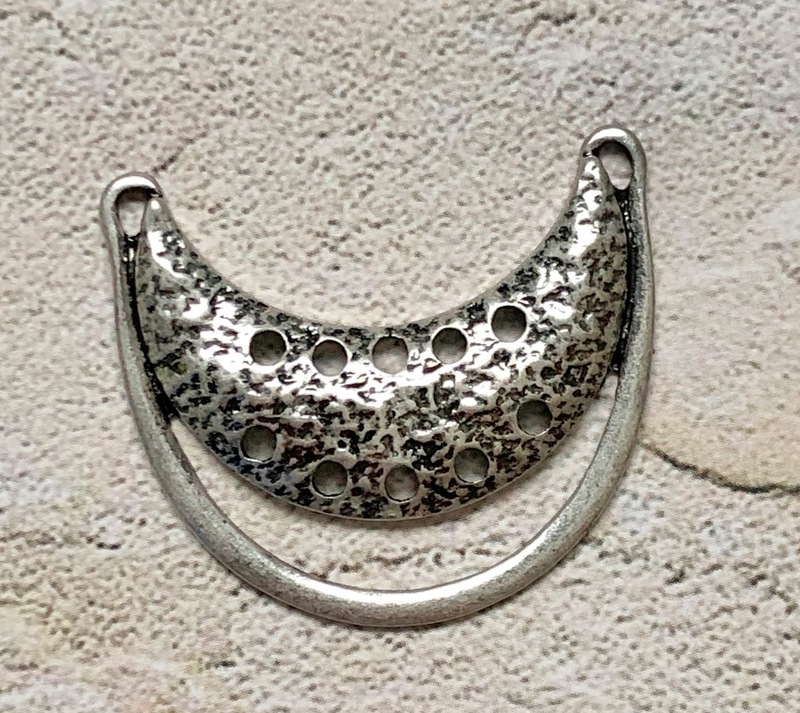 They offer lots of design possibilities, especially for pendants. Crescent shapes have also offered some fun possibilities. 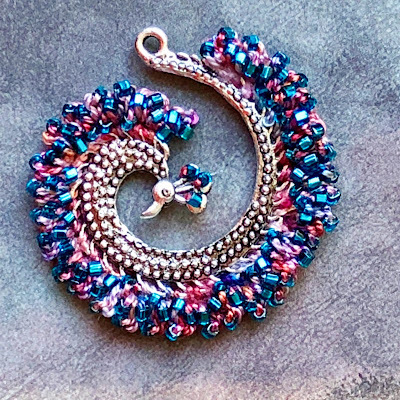 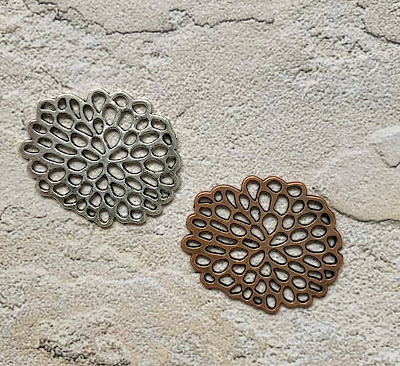 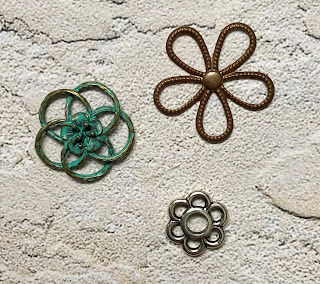 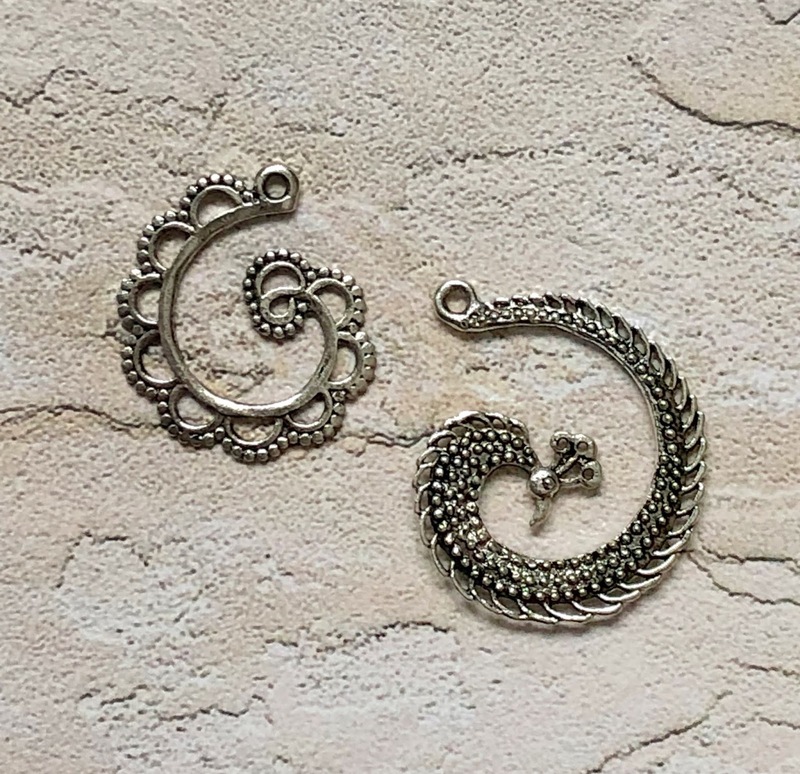 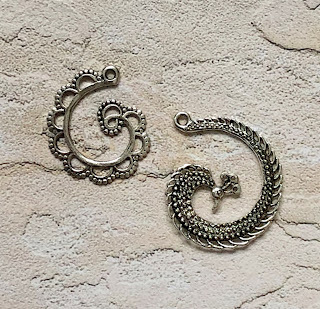 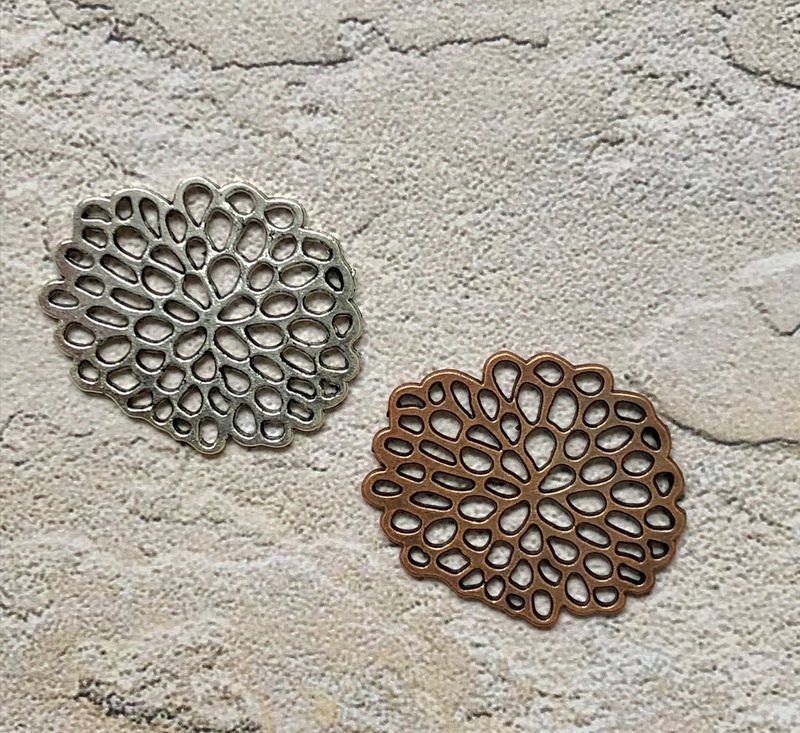 There are lots of shapes and styles of metal focal components out there and they offer endless possibilities for crocheted jewelry. 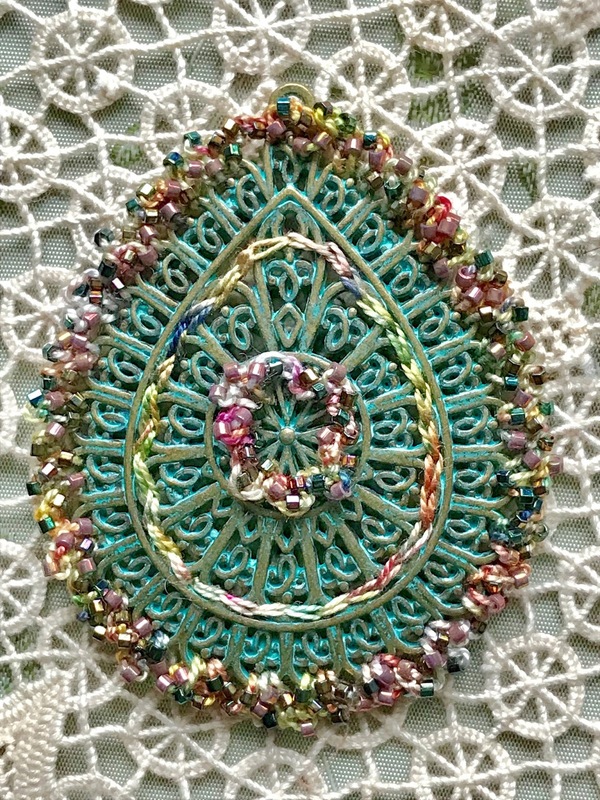 The thread that I've been working with in these mixed media pieces is all hand-dyed perle cotton - usually in size 8 or 12. 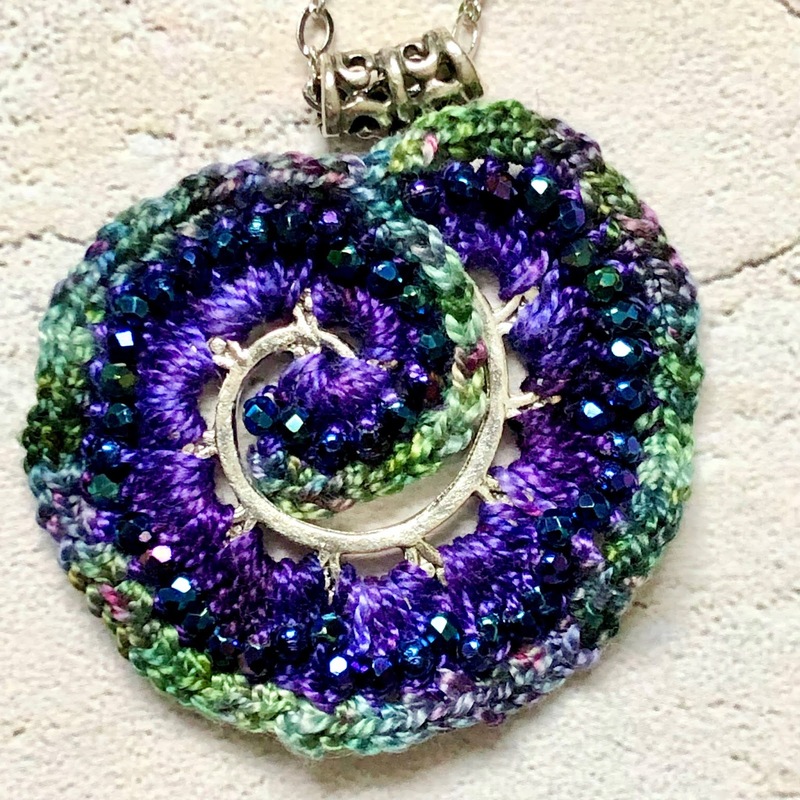 I love to work with the beautiful colors. 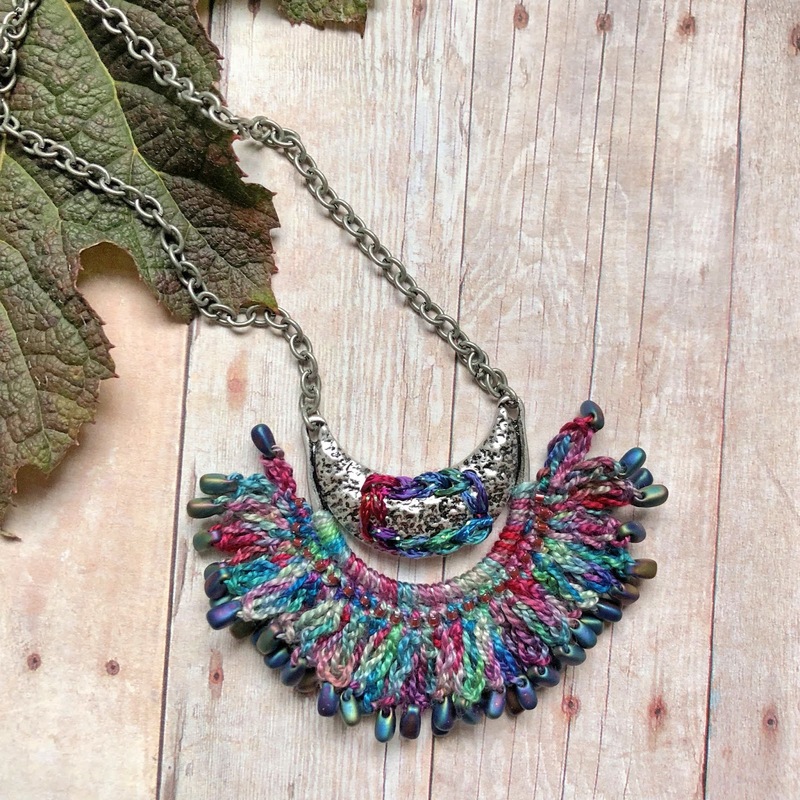 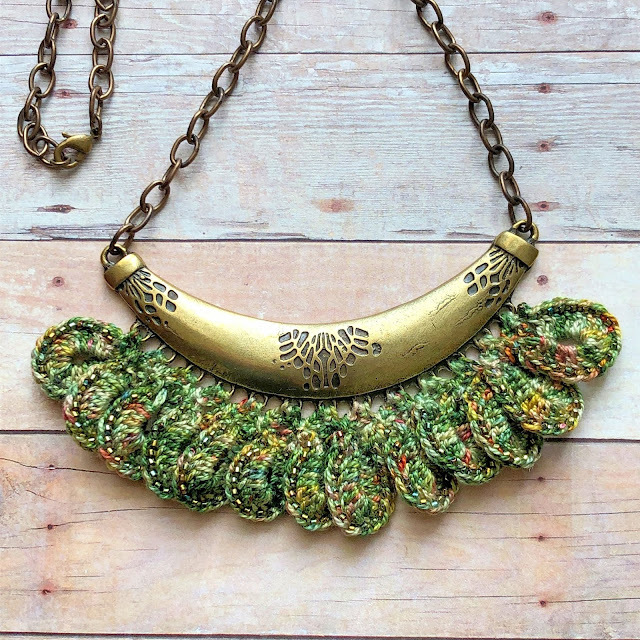 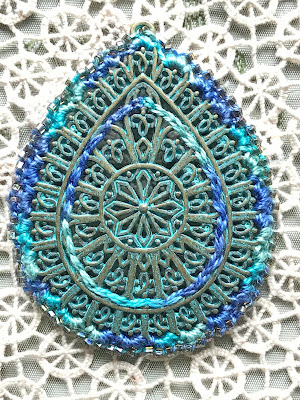 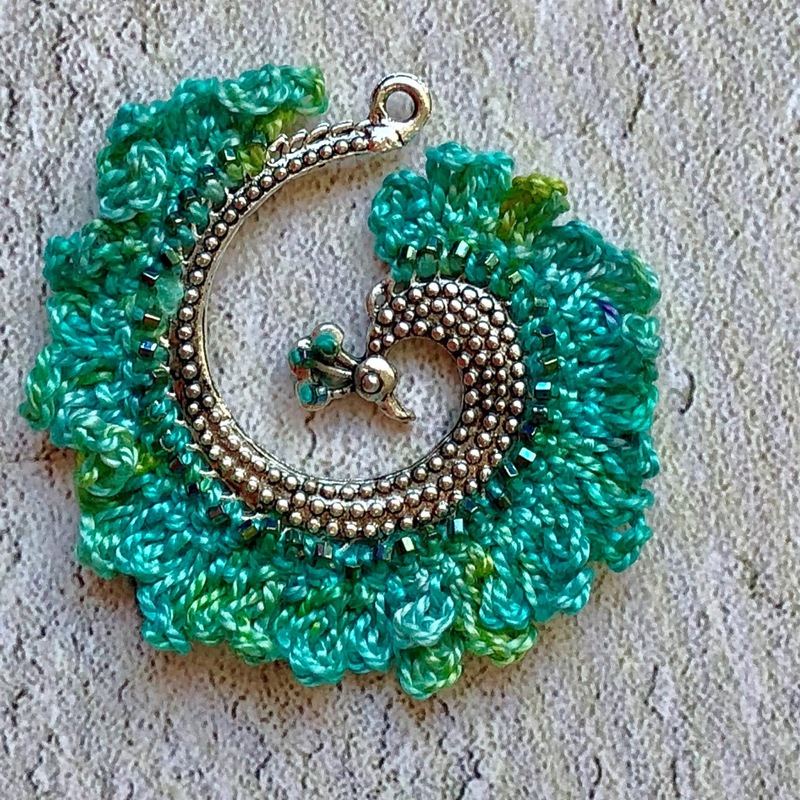 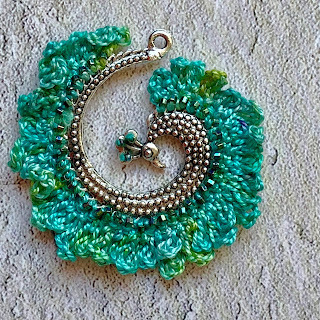 The crochet stitch work and beads add interesting texture to the smooth metal components. 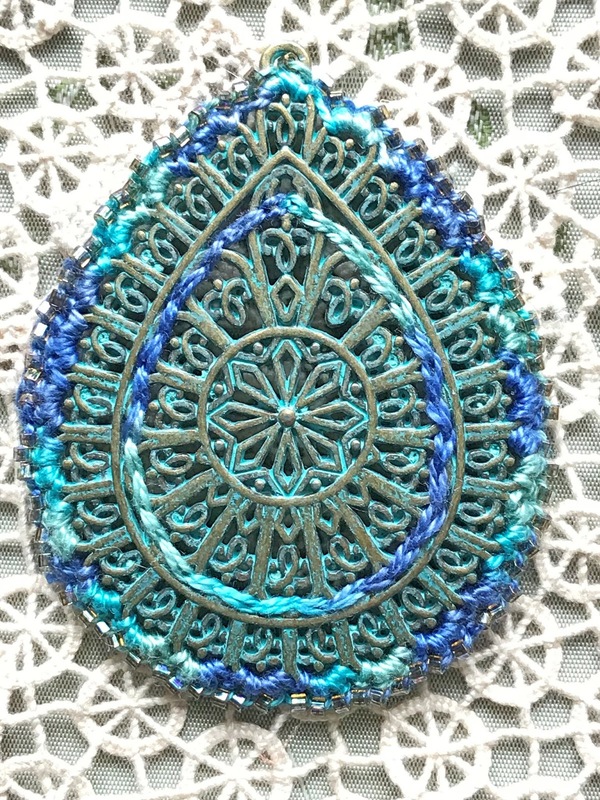 To date, I've worked almost exclusively with Tentakulum Painter's Threads. 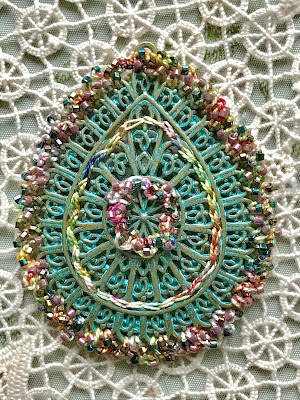 I love the gorgeous colors in palettes used by famous artists, such as Gaugin, Monet, and Klimt. 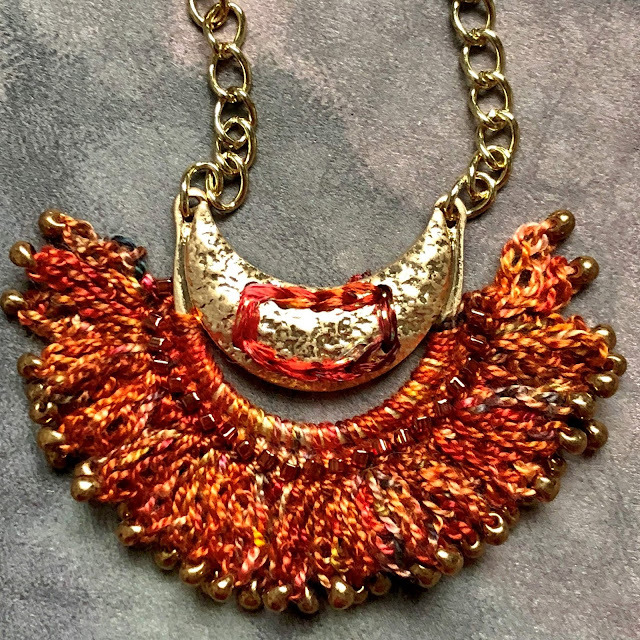 Artistic Artifacts has been a great supply source for buying these threads, which are manufactured in Germany, online here in the US. 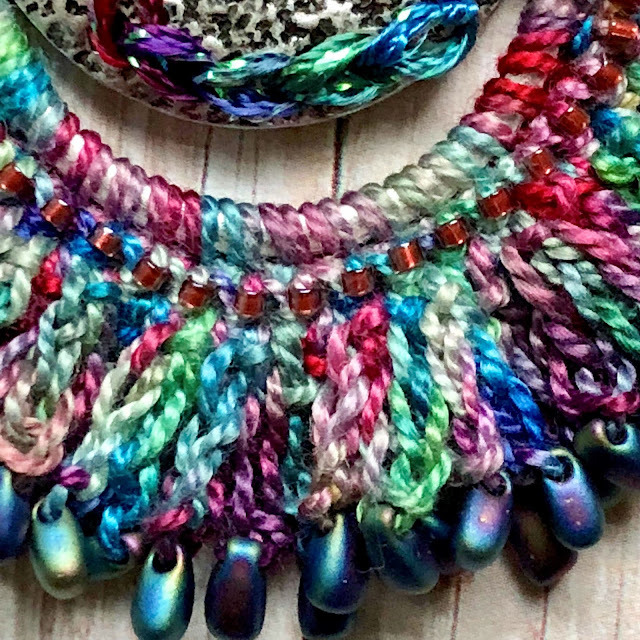 Very recently, however, I also discovered a wonderful Canadian source for absolutely beautiful hand-dyed threads, Colour Complements. Lorraine, the fiber and mixed media artist who creates these artful fibers, does an amazing job and has a large inventory of choices. 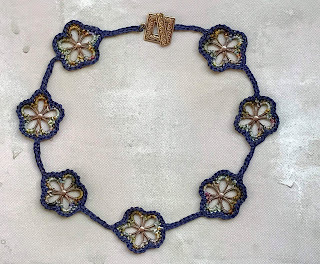 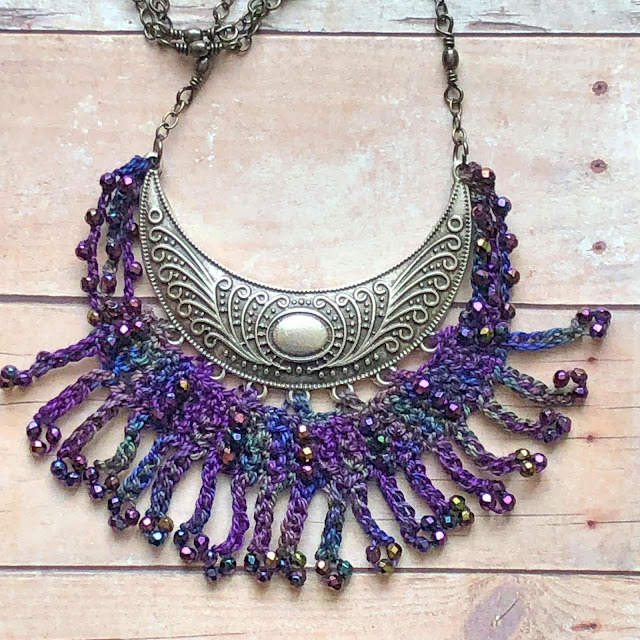 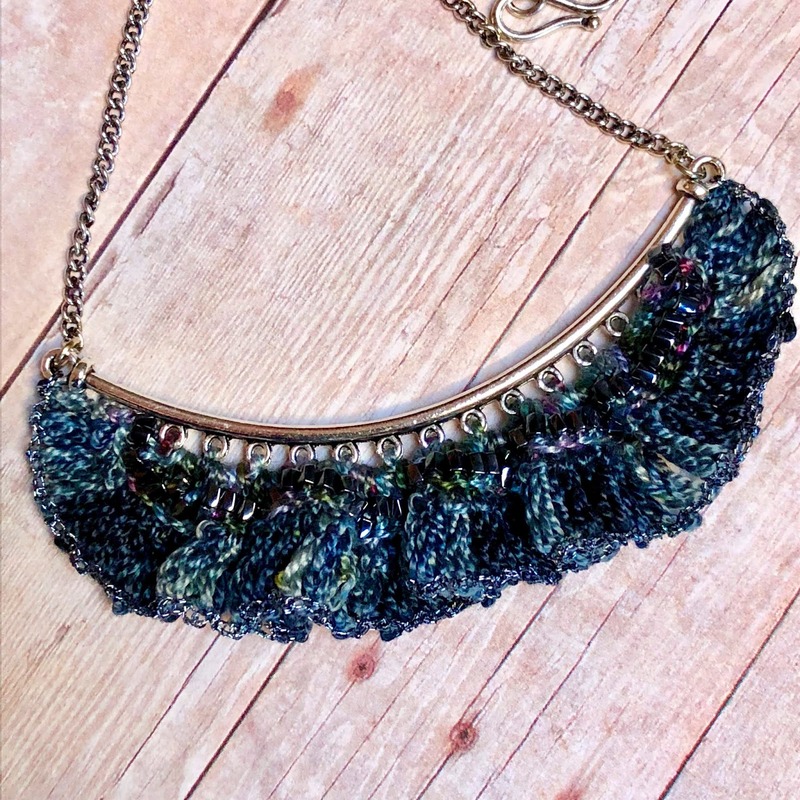 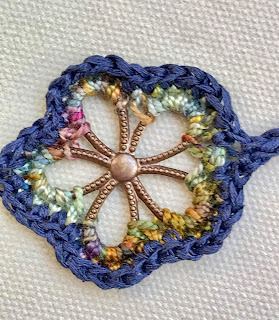 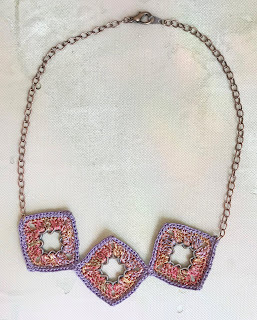 The first piece I created using her threads is the crescent necklace in the purples and jewel tones pictured at the very beginning of this post. I know I'll be using her threads for many more of my pieces in the future. 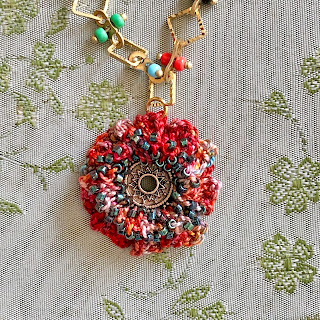 As I create more mixed media, crochet jewelry, I look forward to sharing my work with you. 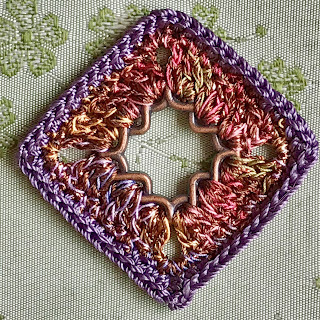 No promises on when my next post will be, but I'll try for sooner rather than later. 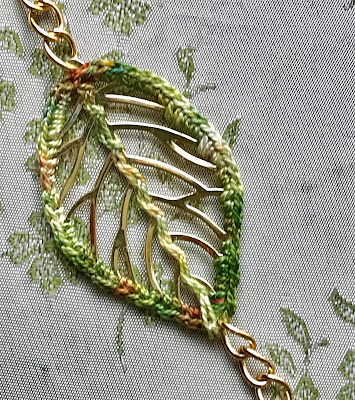 In the meantime, I'd love to hear what you think about this technique and I'd be happy to answer any questions. 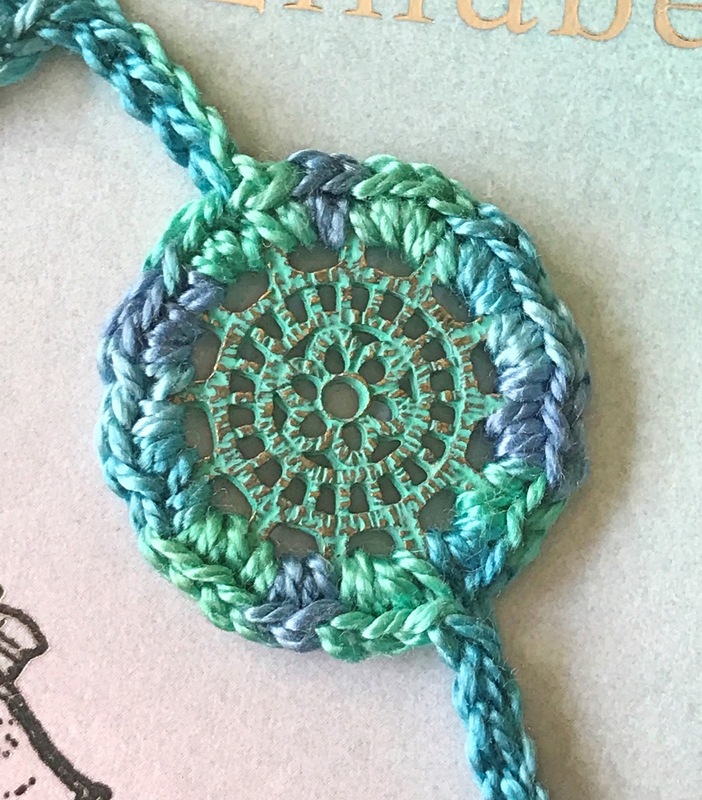 Just get in touch through the comments.